Wolf runners (l to r) Alana Mihill, Lucy Sandahl, and Catherine Lhamon cruise together through the 1600. Jean Lund-Olsen has places to be, and wants to get there quickly. 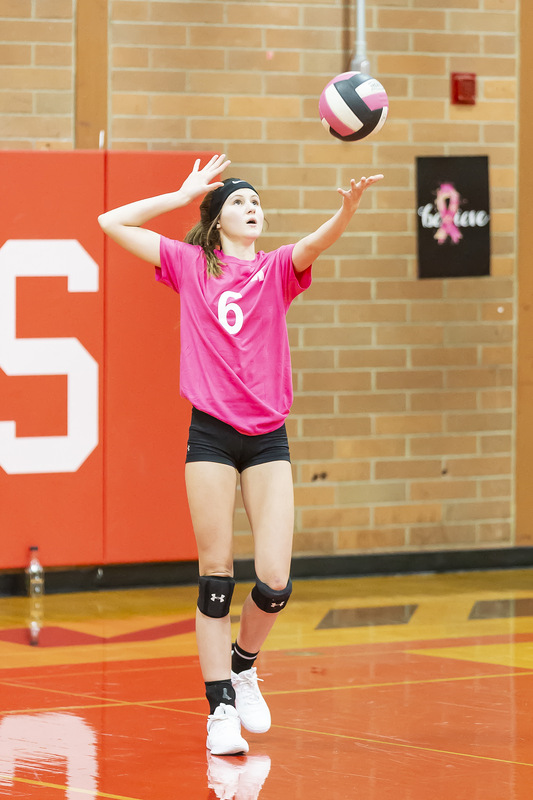 As devoted track and field mom Sherry Roberts noted, the Coupeville High School squads might not have the deepest rosters, but what they have is a ton of talent. 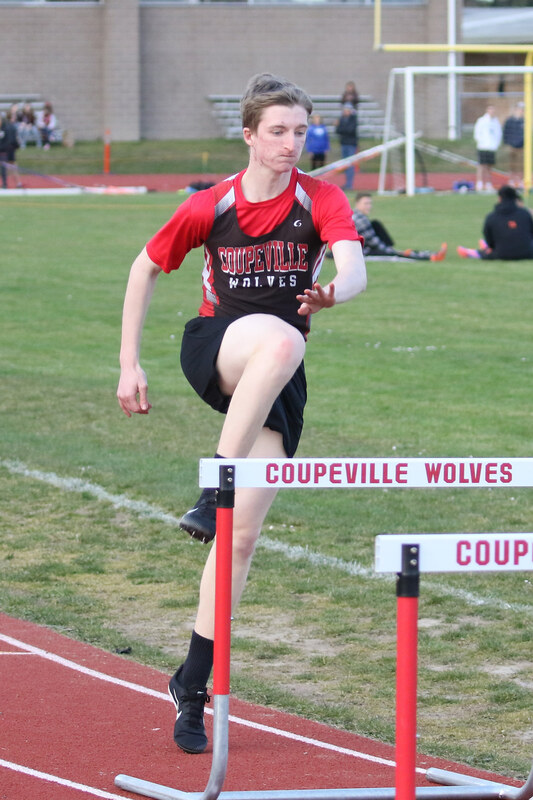 Making sure the world knows, the Wolves dominated at their first home meet Thursday afternoon, taking first in the girls competition, and second in the boys standings. 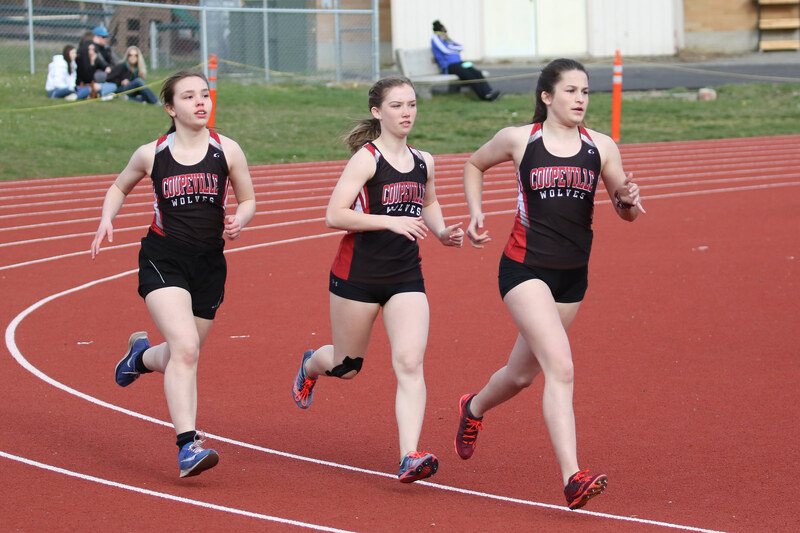 The CHS girls, carried by seven wins, including two relay victories, racked up 76 points, edging South Whidbey (69.5) and Granite Falls (64.5), while La Conner (19) brought up the rear. Emma Smith (shot put), Catherine Lhamon (1600), Maya Toomey-Stout (100), Mallory Kortuem (400), and Lindsey Roberts (100 hurdles) went to the top of the medal stand, while the 4 x 100 and 4 x 200 squads couldn’t be caught. Both of those relay units feature Toomey-Stout, Roberts, and Kortuem, with the Hoskins sisters, Ja’Tarya and Ja’Kenya, each popping up once in the mix. Over on the boys side of things, South Whidbey used its depth to overcame seven individual Wolf wins, capturing the team battle 108.5-79. Granite (32.5) nipped La Conner (29) to claim third. Jean Lund-Olsen and Sean Toomey-Stout were the main men for Coupeville. 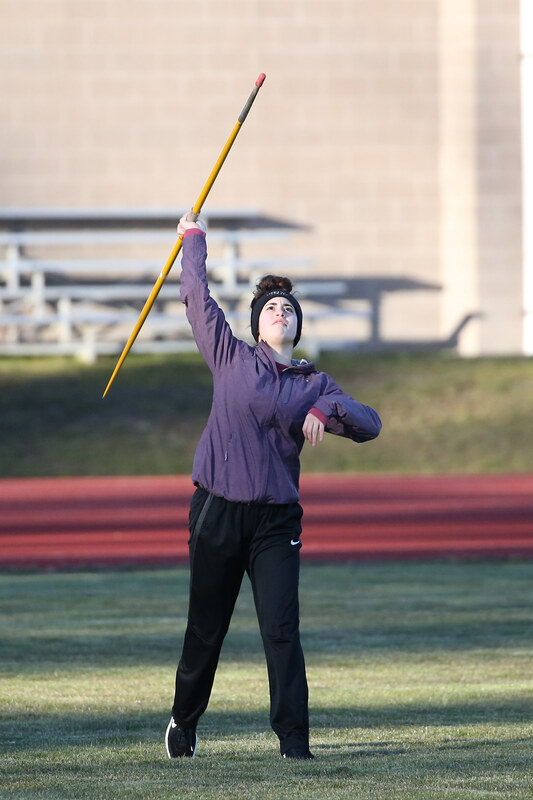 The former swept to wins in the 100 and 200, setting PR’s in both events, while the latter triumphed in long jump and triple jump, while tying teammate Chris Battaglia for first in the javelin. Rounding out the Wolf winners were Ryan Labrador in the shot put and Danny Conlisk in the 400. The win was especially sweet for Labrador, who was celebrating his 18th birthday. 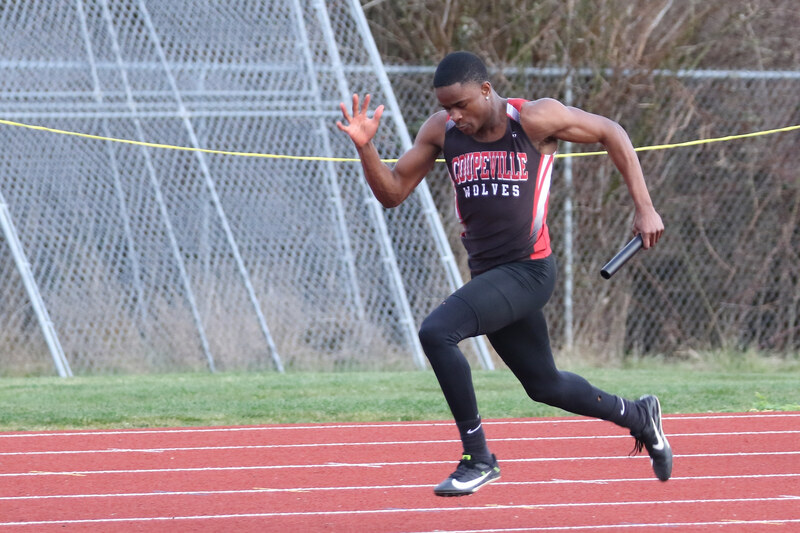 Coupeville racked up 41 PR’s on the day, with 20 athletes nabbing at least one. Megan Behan, Chris Ruck, Brian Casey, Tiger Johnson, Mikaela Labrador, and Elijah Okaruru topped all Wolf competitors, each hauling in 3 PR’s. Mallory Kortuem (left) and Maya Toomey-Stout seek a third-straight trip to state. 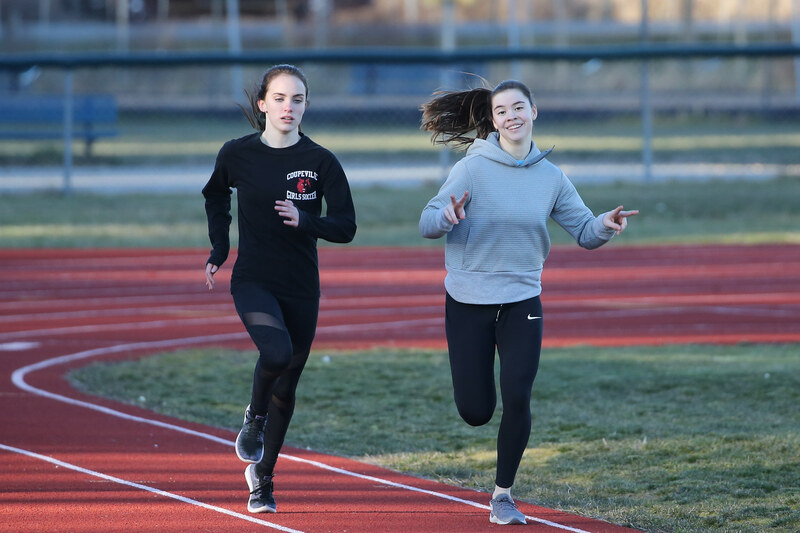 Led by two school record holders, the Coupeville High School girls track squad is primed for success in the new season, individually and as a team. 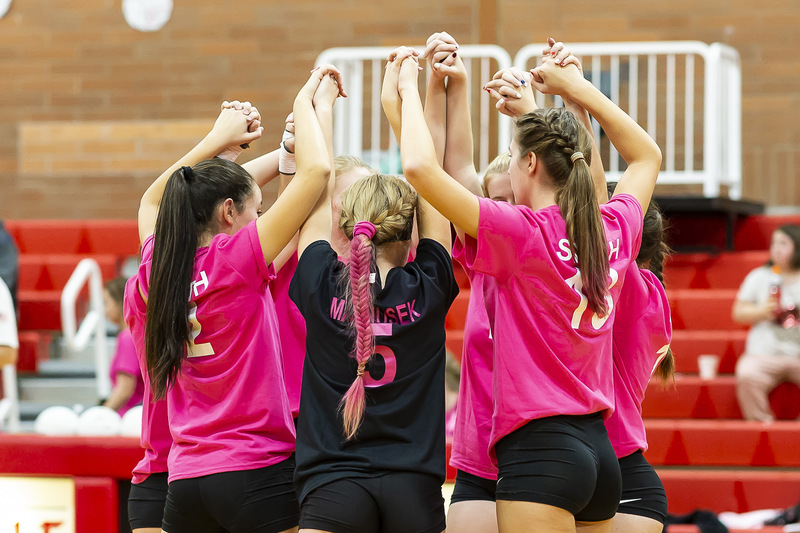 The headliners are senior Lindsey Roberts, and juniors Maya Toomey-Stout and Mallory Kortuem, but the Wolves have exciting athletes up and down the roster. 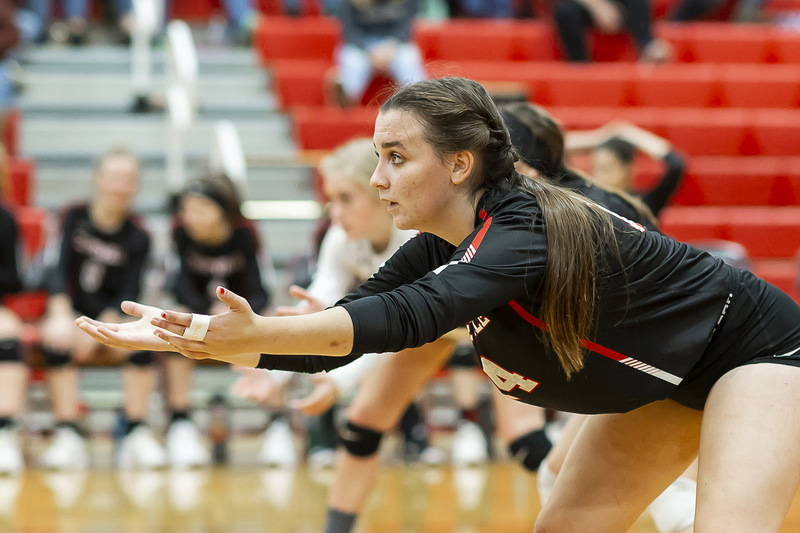 Roberts and fellow senior Emma Smith top a list of nine returning letter winners, with juniors Ja’Tarya Hoskins, Raven Vick, Kortuem, Willow Vick, Toomey-Stout, and Lucy Sandahl and sophomore Catherine Lhamon rounding out that list. Toss in promising freshmen like Alana Mihill and Ja’Kenya Hoskins, and life is good for CHS coach Randy King. Roberts, by virtue of her past body of work, including a school record in the 100 hurdles, earns the biggest spotlight. A five-time state meet medalist, including a 2nd place finish in the hurdles as a junior, Lou has brought hardware home after every one of her three trips to the state championships. As she enters her senior season, Roberts is hot on the heels of Makana Stone (seven medals) and Natasha Bamberger (six), the only Wolf girls to have claimed more state meet success. Kortuem, who shattered the school record in the pole vault last season, and Toomey-Stout, have both been to state twice, winning 5th place medals as part of a relay team their freshmen seasons. Ashlie Shank, who ran a leg on two relay teams (4 x 100 and 4 x 200) which went to state last season, is in a different state after a family move, so the hunt for a fourth relay runner is on King’s mind. “It is hard to say at this time who a fourth participant on relays will be and what distance we will be best at!,” he said. “So far it looks like it will be one of the Hoskins girls. The battlin’ Vick sisters will also be busy, with Willow the team’s top high jumper, and Raven out in front in the javelin, having hit almost 90 feet as a sophomore. 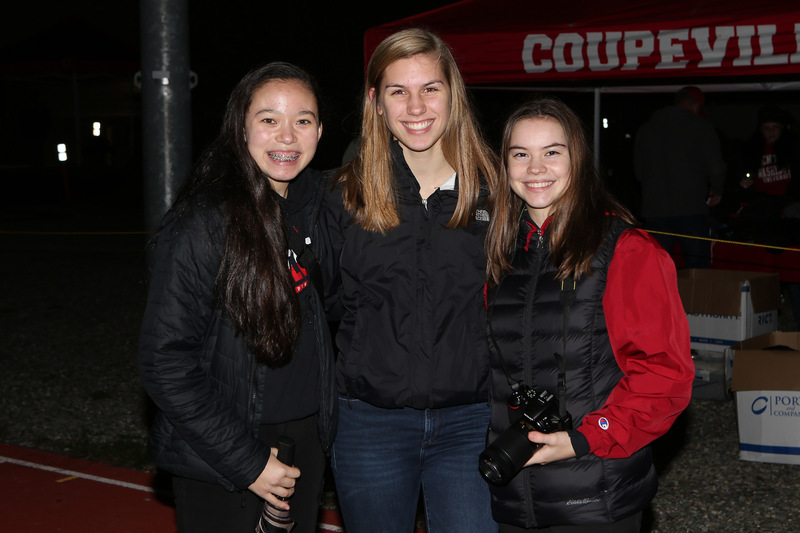 While the Wolf boys have no distance runners, the girls are upholding their school’s long and hallowed tradition in the events. Lhamon, coming off a strong cross country season, and Sandahl are back for year two in the 1600 and 3200, while Mihill and Makaela Labrador join them. 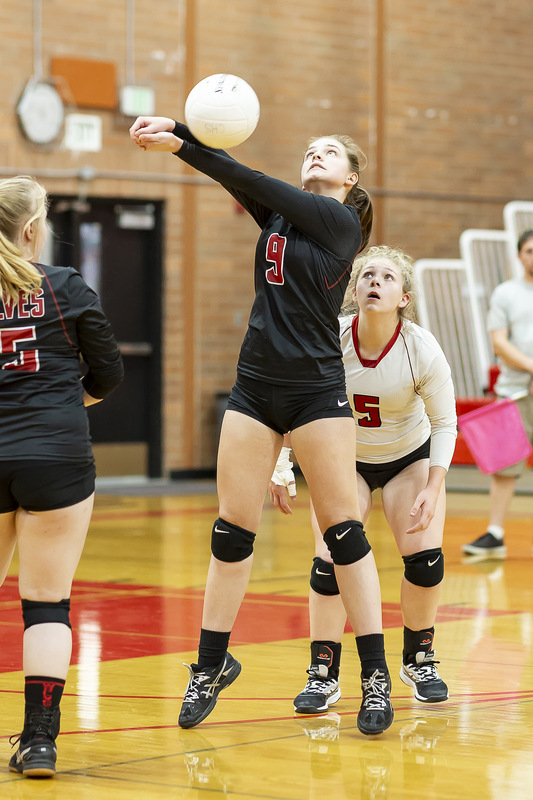 While the sprinters and relay runners have the most state meet experience, senior thrower Emma Smith could soon join them in making the trip to Cheney. 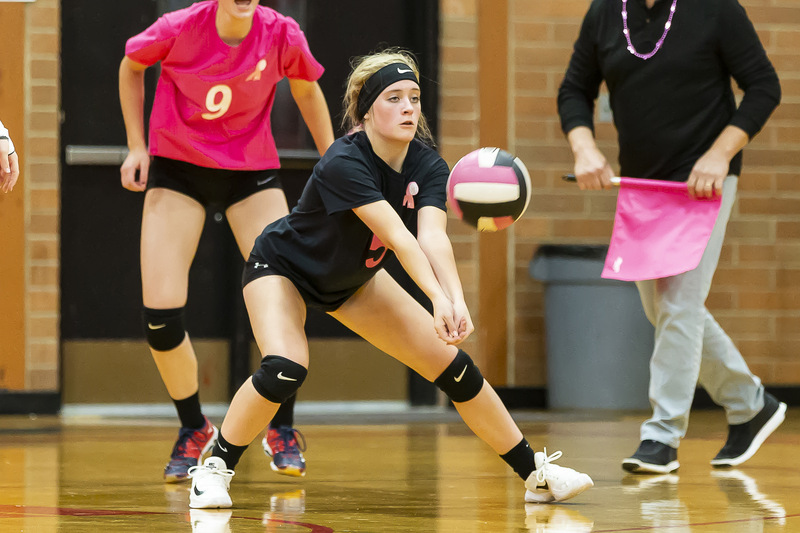 A standout in volleyball, she has consistently improved her distances in each previous season, coming dangerously close to qualifying for state. This year could be her year, said her coach. 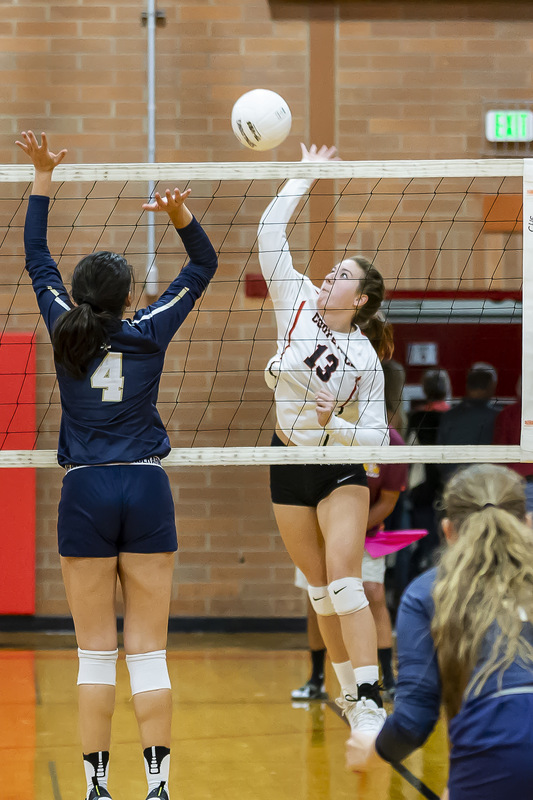 Smith and her teammates open the season Mar. 14 at the Oak Harbor Jamboree, then host the first of three home meets Mar. 21. 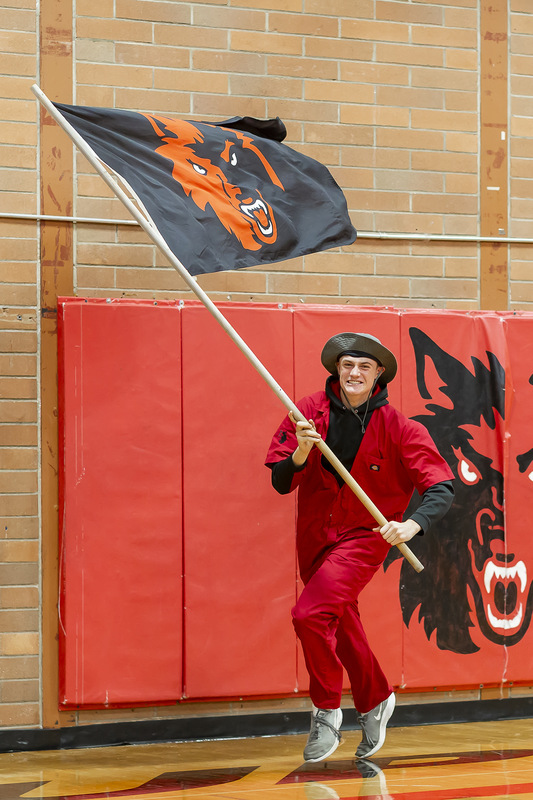 Gavin Knoblich, ignoring pain from football injuries, carries the Wolf flag as he sprints around the court. Eryn Wood (9), backed by Abby Meyers, smashes a return. 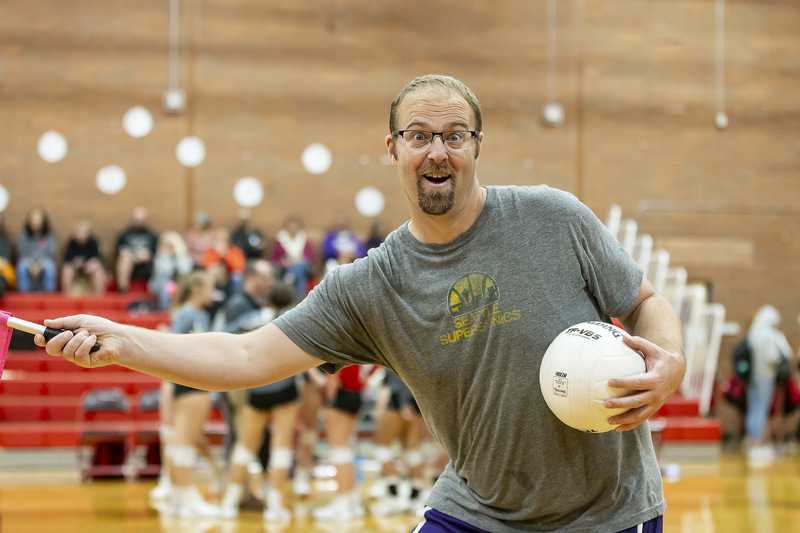 Line judge Michael Davidson overcomes his crippling shyness. “Now, I am become Death, the destroyer of worlds!” Maya Toomey-Stout finds her moment of Zen seconds before caving in a foe’s face with a wicked spike. Kylie Chernikoff enjoys her evening. 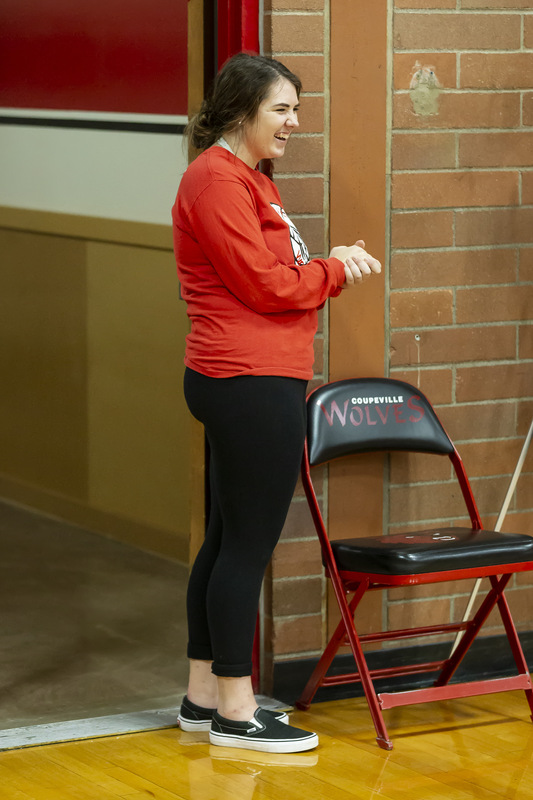 Taped up and ready to tango, Wolf senior Ashley Menges has been holding the line for four years. Action to the right, action to the left, action everywhere. 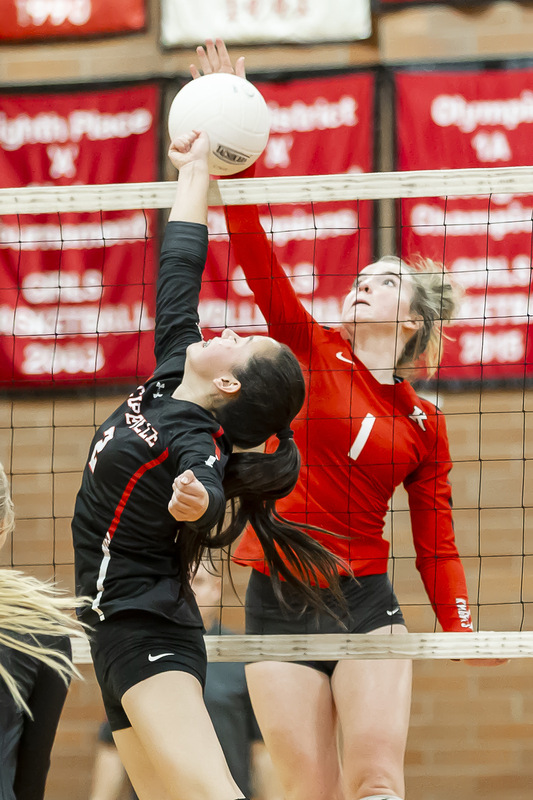 Keeping busy Tuesday night, wanderin’ paparazzi John Fisken snapped pics of the action on the court during Coupeville’s volleyball matches, and off the floor as well. The pics above, a mix of in-the-heat-of-the-moment snaps and sideline activity, are but a small portion of what he shot. When you do, remember that any purchases help fund scholarships Fisken awards each year to two CHS senior student/athletes. Fight like a girl, win like a Wolf!! 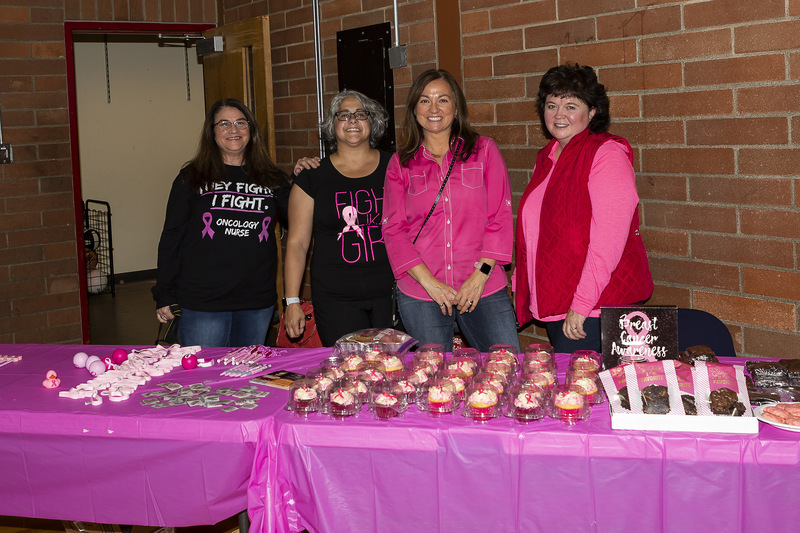 Moms (l to r) Lisa Toomey, Maria Reyes, Irene Echenique and Renae Mulholland sell sweet treats for a good cause, as CHS raises money for cancer research. 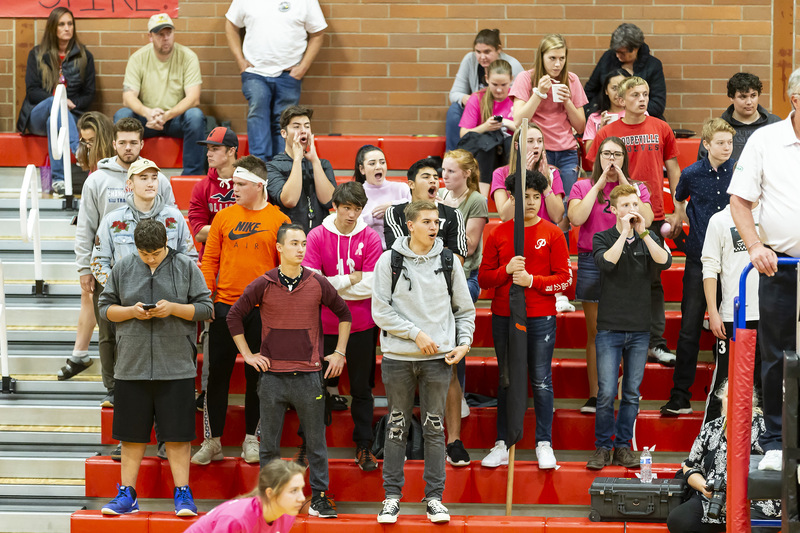 The Coupeville student section brings the noise and the funk for the rivalry game. 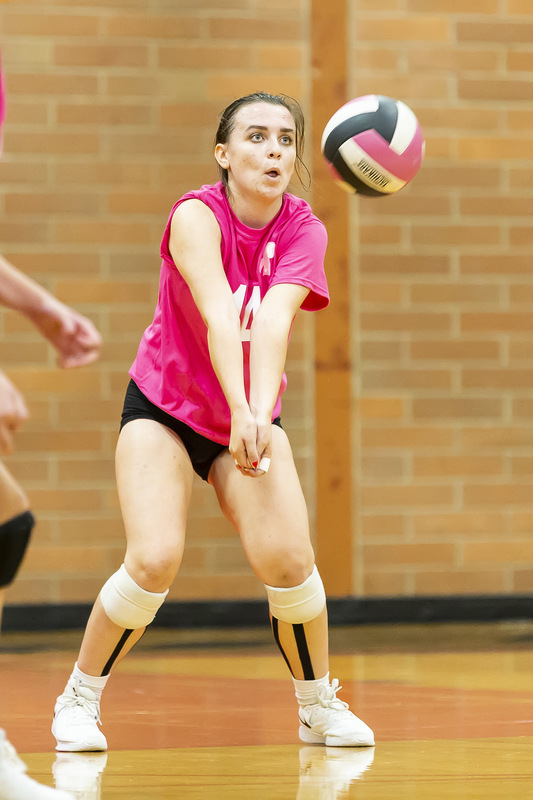 Maddie Vondrak whispers “I’m so sorry” to the volleyball, seconds before hitting it so hard the side of the ball caves in. 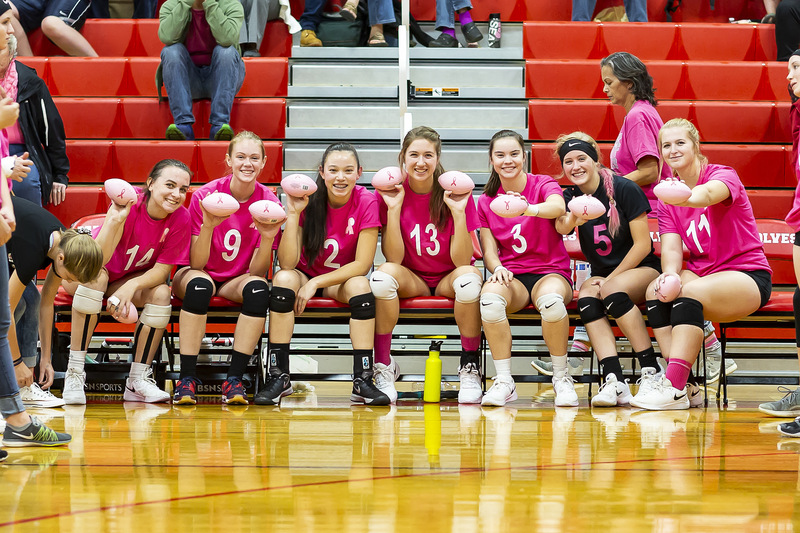 The Wolf varsity holds special pink footballs they later tossed to their fans. Maya Toomey-Stout gets down with her bad self. 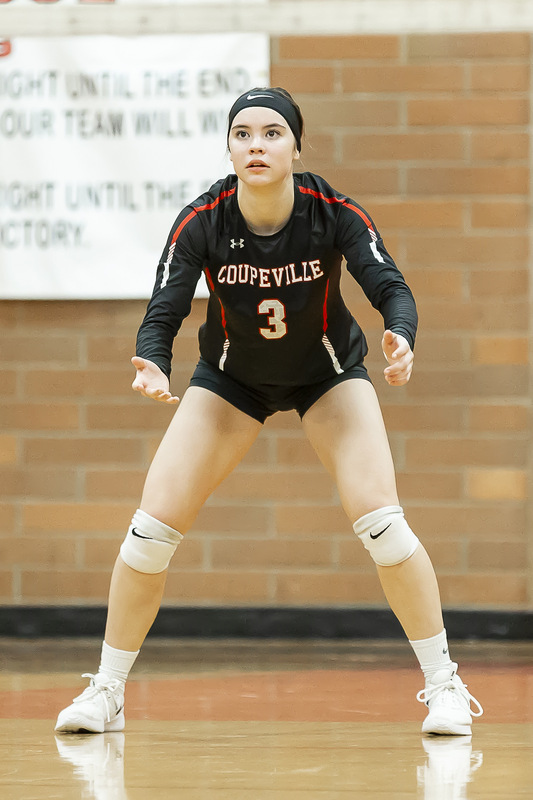 Scrappy libero Emma Mathusek, the glue that holds the Wolves together. 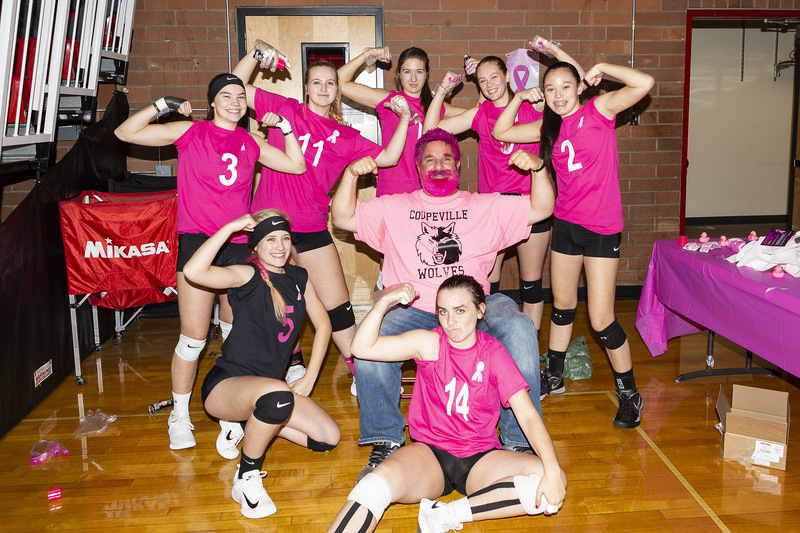 After turning photographer John Fisken pink in honor of his sister, who fought breast cancer, the Wolves bring out the gun show. The spikes were slammin’, the cameras were clickin’ and the money was rainin’ down. 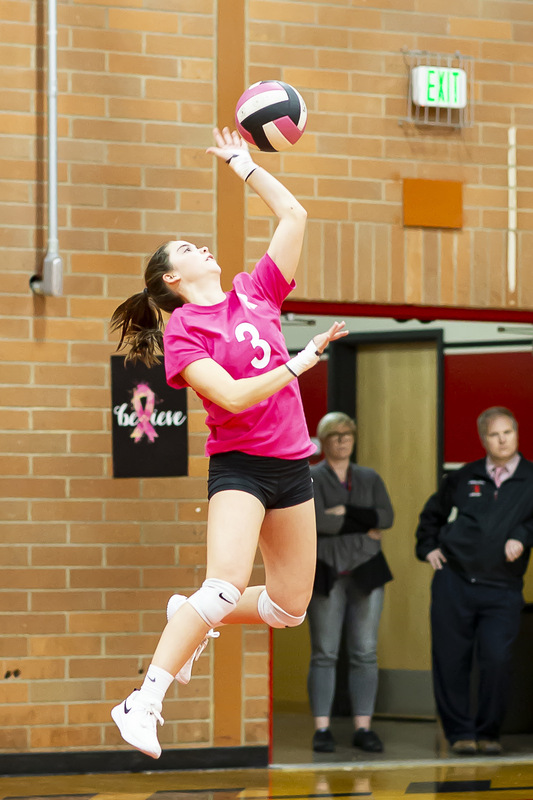 The Coupeville High School volleyball squads waged titanic fights with visiting South Whidbey Monday (JV fell just short, while the Wolf varsity rolled to a big win), while also raising money for cancer research. 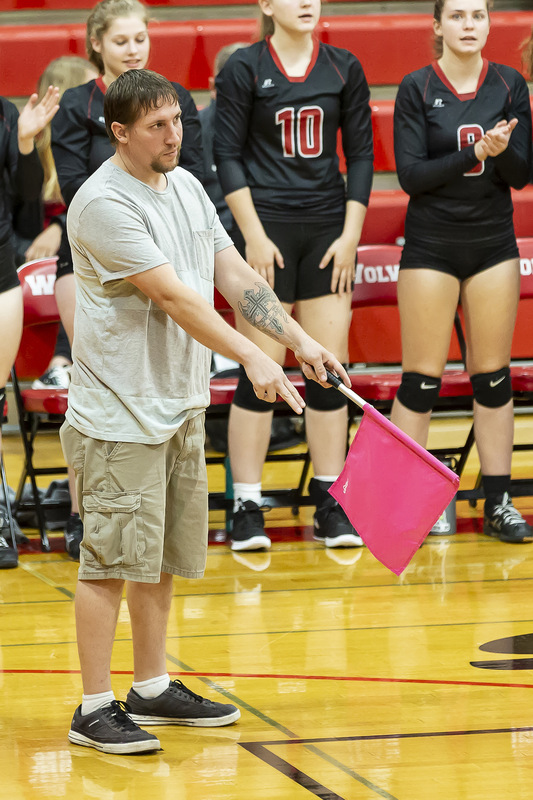 Along for the ride on Dig Pink Night was wanderin’ camera clicker John Fisken, who snapped pics in between having his lush locks and beard sprayed pink in memory of his sister, who fought bravely against breast cancer. When you do, a percentage of any sales goes to help fund scholarships for CHS senior student/athletes.